Do you often hide your mouth when speaking, smiling, or taking pictures because you do not like how your teeth look? Do not worry, you are not alone. In fact, as much as one-third of adults dislike the appearance of their smiles. You can get the beautiful smile you crave using a minimally invasive procedure. Direct cosmetic tooth bonding in our Weatherford office is a simple and effective treatment to drastically improve your teeth. Dr. Garrett Mulkeyat Cosmetic & Family Dentistry of Weatherford will give you the flawless results you want to enhance your confidence. What is Direct Tooth Bonding? Direct bonding is a cosmetic treatment that changes the overall color, size, shape, and proportion of your teeth to create a harmonious smile. A tooth-colored composite resin material is applied to your teeth to fix your cosmetic concerns. Also called cosmetic bonding, it is often used as an alternative to veneers because it does not require you to permanently change your teeth. You will enjoy natural-looking results without needing to undergo a lengthy, invasive treatment. What Can Direct Bonding Fix? You first need a consultation with your cosmetic dentist in Weatherford to ensure you are a candidate for the procedure and to create your customized treatment plan. Depending on how many teeth are being treated, you may need more than one appointment to achieve your desired results. On average, the process takes about 30 to 60 minutes per tooth. Dr. Mulkey cleans your teeth and applies a weak acid to them to open the pores in your enamel. This allows the resin to bond securely to your teeth. Dr. Mulkey uses a color guide to match the resin to your enamel. He applies the putty-like material to your teeth and sculpts it into the perfect shape. 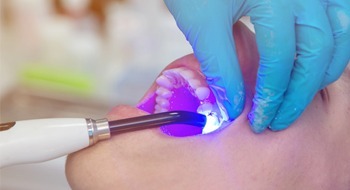 Dr. Mulkey then uses a special blue light to quickly harden the resin. He smooths and polishes your teeth to give you a radiant smile from the moment you step out of our office. How Long Will My Smile Last? Cosmetic bonding can last for an average of 5 to 10 years before needing to be replaced. To protect your investment, it is best to brush your teeth twice per day using a soft-bristled toothbrush and nonabrasive toothpaste. Do not forget to floss your teeth every night before going to bed. Although direct bonding is durable, it can break if you bite or chew on overly hard foods, use your teeth as tools, or chew on inedible objects. The resin can also stain if you smoke or consume darkly pigmented foods and drinks frequently. 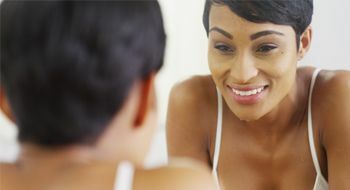 You can love the smile you see in the mirror with the help of your cosmetic dentist. Contact our office today to see if direct bonding is right for you.